An in-depth training in unfolding the depths of compassion and unconditional love. There is no more powerful vehicle for knowing yourself and others than the human heart. For it is through the opening of the heart that we touch our own deepest experience, and come to connect with each other. 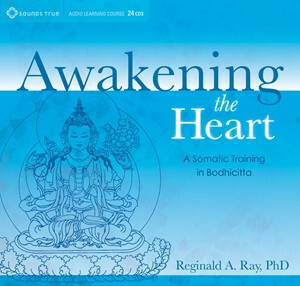 In Awakening the Heart, Dr. Reggie Ray presents a 24-CD somatic training curriculum designed to help us dismantle the walls around our hearts and dwell in bodhicitta (literally “awakened heart mind”). We find ourselves in this predicament because of our culture›s emphasis on the left-brain or “thinking mind” as the primary lens for viewing oneself and the world. In Awakening the Heart, Reggie will lead you through a progressive series of teachings and body-based meditations for rediscovering the vast and mysterious domain of the human heart—and accessing the depths of wisdom available within your body at this very moment. This is the path of bodhicitta, a compassionate commitment to be present to life and transform oneself in order to love everything that is in a way that is infinite and unconditional. “Who we are in our essence is a living field of awakened and boundless love,” teaches Reggie. Awakening the Heart is your invitation to the lifelong journey of reconnecting to our fundamental goodness and cultivating our capacity to love. I just got this email from Tami about the new programme “Awakening the Heart “ by Reggie Ray. I read the webpage and . . . I just have to cry and cry and cry. Tammy and Reggie, talking about the hammer and nail. Well this just went straight through my heart, right through in one blow. I feel so lost and hopeless, and also so angry deep within, all the pains and hurts from days gone, still so alive within me . . . is there any way to find my way back to “open Heart” and “sensitive Living”???. Would it be possible that this program will help some and a bit ?? Is here still Light in my Heart ?? Thank You, Thank You, Tami, Reggie and the whole Sounds True team for this program.